Note: in British English, flax generally refers to the fibre crop while linseed refers to the oil crop. In American English, the two words are more interchangeable (Muir et al., 2003). In this datasheet, flax will refer to the plant and linseed(s) to the seeds. Linseeds are the seeds of the flax plant (Linum usitatissimum L.). 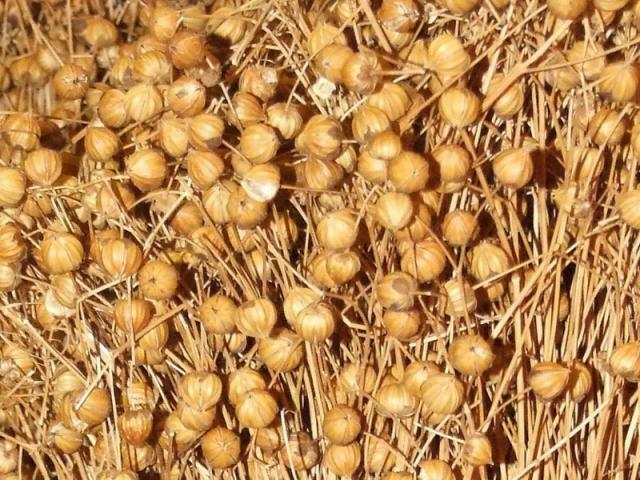 Flax is grown for its oil or its fibre, depending on the variety, and linseeds usually come from flax varieties intended for oil production. Linseeds are rich in oil and protein and are suitable for livestock, particularly as a source of polyunsaturated and omega-3 fatty acids. 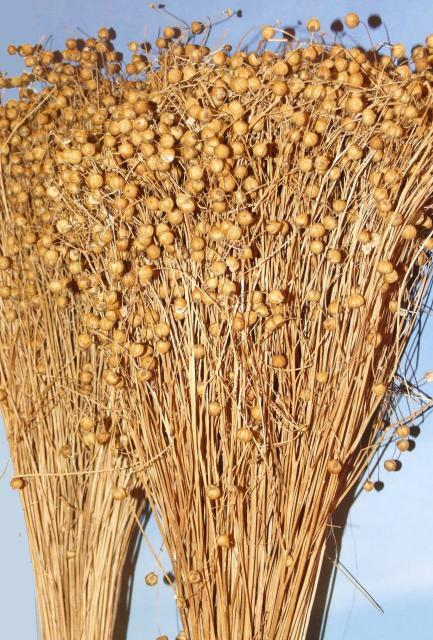 Flax is a summer annual erect plant, 20 to 150 cm high, with a tap root. The height and the branching habit of the plant mainly depend on its intended use. Large-seeded genotypes intended for oil production are many-branched and shorter than typical fibre flax. The leaves are alternate, linear to linear-lanceolate, 15-55 mm long x 3-13 mm broad, and drop as the plant matures. The flowers are apical and borne in panicle-like inflorescences. The fruits are round, dry capsules, 5-9 mm in diameter, that contain 10 seeds in large-seeded oil varieties and less in fibre varieties. Linseeds are ovoid, 3.3-5 mm long. The weight of 1000 seeds ranges from 4 to 13 g. The seeds are yellow, dark brown or olive coloured. Linseeds from oil varieties contain high amount of oil and protein in the endosperm and in the cotyledons. Mucilage produced in the epidermal cells protects the seed from digestion by animals, which may or may not result in health benefits for the consumer (human or animal) (Muir et al., 2003). Linseeds are primarily used for the production of linseed oil, which is used in paints and other industries, such as the manufacture of linoleum. Linseed meal, which is the by-product of oil production, is a valuable protein-rich feed for livestock. 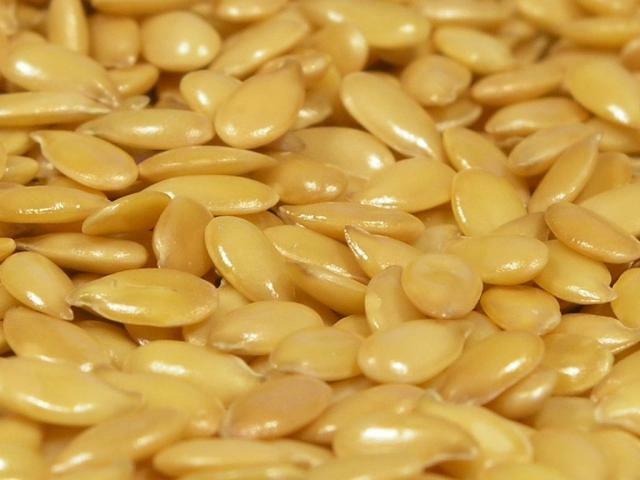 Whole linseeds are, like other oilseeds, primarily an energy feed due to their lipid content. Linseed has attracted considerable attention since the 1990s due to the presence in the oil of polyunsaturated fatty acids (PUFA), notably alpha-linolenic acid (ALA, an omega-3 fatty acid), and conjugated linoleic acid (CLA). Adding these fatty acids to the diets of livestock alters the fatty acid profile of meat, milk and eggs in order to provide health benefits to human consumers. Other benefits include laxative properties and positive effects on the appearance of skin and hair (Newkirk, 2008; Muir et al., 2003). 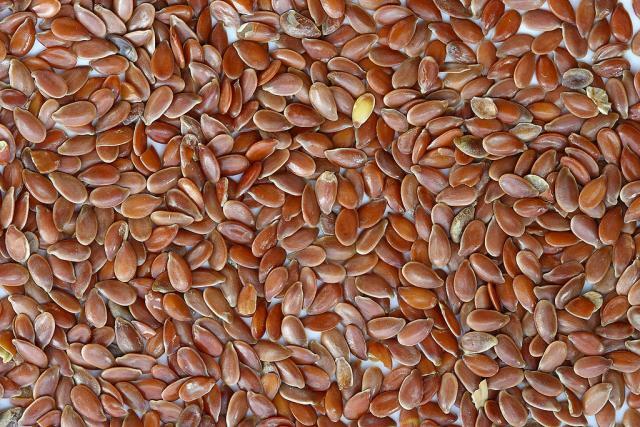 Linseeds and linseed oil contain large amount of lignans, which act in mammals as phytoestrogens and have anticarcinogenic properties (Przybylski, 2005). Flax is thought to have originated from India and to have spread westwards following trade routes. It was brought to North America and Australia by colonization (Muir et al., 2003). Flax is possibly one of the first domesticated crops. It was grown and used for fibre, food and its medicinal properties from about 10,000 BCE in the Fertile Crescent. Linseed oil was first used as an oil painting preservative by the Flemish painter Jan van Eyck around 1400. The linoleum process, which used linseed oil to create durable floor covering, was patented in 1860 in England. Today flax is valued both for its industrial uses (oil and fibre) and for the potential health benefits of the seeds (Przybylski, 2005; Muir et al., 2003). Flax is mainly grown in temperate areas. In 2012, there were 2.7 million ha in the world used to produce linseeds and production reached 2 million t. The main linseed producers, Canada, Russia, China, Kazakhstan and the USA, account for more than 70% of the total production (FAO, 2013). Flax is a warm season crop and can be sown once soil temperature rises. No till or shallow tillage is preferred as these methods provide a firm seedbed, bring few weeds to the surface and do not disturb the organic matter content of the soil. The linseed crop does better on heavy loam soils with good moisture content than on dry sandy soils. It responds well to fertilizer and can withstand some salinity. Linseed is a poor weed competitor. The linseed crop may be grown in rotation with cereal grains but not following potatoes or sugar beet, due to problems with root diseases, or following a previous linseed crop (CFIA, 2012). Linseeds are small and hard seeds that when eaten are not crushed thoroughly by the grinding action of the teeth (Kohnke et al., 1999). This incomplete grinding limits the action of digestive enzymes, and thus the availability of the lipids to the animal (Raes et al., 2004). Raw linseeds contain cyanogenic substances (see Potential constraints on the "Nutritional aspects" tab) that are released in the presence of water, but they can be destroyed by high temperatures (Brunschwig et al., 2010). For these reasons, mechanical processing (crushing, grinding) and heat treatments (boiling, rolling, extrusion) are recommended to improve the nutritive value of linseeds. The co-extrusion or blending of linseeds with other grains, seeds and by-products (oil meals, bran) is commercially done to create products that are easier to process and store than linseeds extruded alone, due to a lower amount of released oil and a higher nutritive value (Brunschwig et al., 2010; Thacker et al., 2004; Htoo et al., 2008; Beaulieu et al., 2010). Linseeds should be harvested when 75% of the bolls have turned brown. The seed may require further drying before being ready for storage. If weather conditions are not satisfactory, the crop should first be put into swaths before being threshed. Because frost may cause damage to the maturing crop, swathing should also be considered to hasten seed maturation before the first frosts (Muir et al., 2003). Linseeds containing less than 9.5-10% moisture can be stored for one year. The high oil content favours self-heating and may result in spontaneous combustion when moisture is too high. Self-heating leads not only to a reduction in oil and oilcake quality (rancid odor and taste) but also in quantity (TIS, 2013). The flax crop generates large amounts of flax straw, and the disposal of this by-product is a major environmental issue in flax-growing regions. Flax straw is poorly degraded and difficult to plough down in the soil, since the fibres wrap themselves around and/or plug disks, wheels and shovels. For that reason, flax straw is often burned on the ground, which causes air pollution and health concerns (FCC, 2014; CLA, 2014). However, there are now many other uses for flax straw, such as turning it into an alternative fibre source or as a biofuel, which may alleviate the environmental problems caused by this residue (Comeau, 2006; FCC, 2014). Feeding ruminants with linseeds, particularly extruded linseeds, has been shown to reduce CH4 emissions. In dairy cows fed maize silage + 5% raw linseeds, extruded linseeds or linseed oil, methane emission was reduced by 12, 38 and 64%, respectively (Martin et al., 2008). In a further trial, increasing the level of extruded linseeds (5, 10 and 15% of the diet) in lactating dairy cows rations reduced CH4 emissions by respectively 10, 16 and 41%, respectively (Martin et al., 2010). Adding linseeds to the grass or maize-based diets of fattening bulls reduced CH4 emissions during the 18 months of the trial (Eugène et al., 2011). Methane production decreased (up to 30%) with increasing ground linseed levels (0 to 15%) (Velez, 2012). Linseeds are relatively rich in protein (20-28% DM) and oil (31-43% DM) and are, therefore, used as a source of protein and energy in livestock diets. However, their fibre content (about 10% crude fibre), and the hardness of the seed coat are limiting in monogastrics. The presence of antinutritional factors makes them less valuable than other oil seeds. The main benefit of linseeds in livestock feeding is that they are the richest source of omega-3 fatty acids among oil seeds, as linseed oil usually contains 45-60% alpha-linolenic acid, depending on the variety (ranges of 31-72% have been reported) (Przybylski, 2005). Immature linseeds contain glucosidic substances such as linamarin, linustatin, and neolinustatin. At temperatures between 40 and 50°C, with an acidity level between pH 2 and 8, and in the presence of moisture, the linase enzyme releases hydrogen cynanide (HCN). In the normal oil extraction process, the high temperature destroys the linase and no HCN is released, but unprocessed whole seeds and linseed meals processed under low temperatures can be toxic to animals, notably monogastrics, especially if the seed or the cake is wetted before being fed (McDonald et al., 2002). It has been recommended to add seeds to boiling water (rather than to cold water), and then boil for five minutes. This process ruptures the seed coat and allows the cyanide producing compounds to react and/or be destroyed, and any cyanide to evaporate. The cooked seeds form a thick mucilaginous mass (Kohnke et al., 1999). Extraction with trichloroethylene or carbon tetrachloride destroys the glucosides (Przybylski, 2005). Linseeds contain linatine, a vitamin B6 (pyridoxine) antagonist, in concentrations ranging from 20 to 100 mg/kg. Symptoms of B6 deficiency can be observed in broilers fed linseeds and it is recommended that diets containing them, or linseed meal, be supplemented with vitamin B6 (Newkirk, 2008). Linseeds contain 2-7% of water-soluble carbohydrates, mucilages or mucins, which interfere both with processing and digestion (Przybylski, 2005). Mucilages absorb water, increasing intestinal viscosity and causing a laxative effect. While this effect can be beneficial in humans, it can result in reduced performance in livestock, notably in young birds (Alzueta et al., 2003). Adding fibre-degrading enzymes and the gradual introduction of linseeds have been suggested to alleviate these antinutritional effects (Slominski et al., 2006). Linseeds are used in ruminant diets both as an energy-rich feed and as a supplier of polyunsaturated fatty acids (PUFA). Supplementing ruminant diets with linseeds can enhance the fatty acids profiles of meat and milk products which is a benefit to human health. Other benefits of linseed supplementation include a reduction in methane production, particularly with extruded linseeds (see Environmental impact on the "Description" tab) and a greater resistance to diseases in newly weaned calves and feedlot steers (Maddock et al., 2005). Linseeds can be used raw, crushed, extruded or protected with chemical treatment (formaldehyde) which protects the PUFA against hydrogenation within the digestive tract. In general, whole linseeds fed up to 15% (diet DM) have no effect on DM intake at any stage of lactation. Feeding whole, rolled or extruded linseeds did not modify rumen ammonia or volatile fatty acids content, which can explain the lack of effect on DM intake, as long as total dietary fat concentration was below 6% DM. Linseed supplementation seems to have a neutral effect on milk yield in early lactation and little effect in mid-lactation. Feeding raw linseeds had generally no effect on milk fat and milk protein, and processing had little effect (Petit, 2010). When whole or crushed linseeds were included, in order to bring the total lipid content of the diet to 6 or 9%, no significant effects on DM intake, milk yield and milk composition were observed (Brunschwig et al., 2010). Formaldehyde-treated linseed offered at 2.4% to 17% in a diet for dairy cows in early or mid-lactation had no effect on DMI in early lactation, but some increases were noted at the mid-lactation stage (Petit, 2010). The following table summarizes several trials with dairy cows. Generally, including raw or processed linseeds modifies the fatty acid profile of milk fat, as it increases the proportion of unsaturated fatty acids at the expense of saturated fatty acids. When raw, extruded or crushed linseeds are included in order to bring the total fat content of the diet at 6 or 9%, the total saturated fatty acids content (% milk fat) decreased by 6 to 10 percentage points whereas the unsaturated fatty acids content increased in the same order (Brunschwig et al., 2010). A meta-analysis of the literature showed that both raw and processed linseeds increased C18 and C19 fatty acids (saturated or unsaturated) content in the milk fat but decreased or had no effect on short to medium chain fatty acids (C4 to C17) and on longer chain (more than C19) fatty acids. The effect was more pronounced with processed linseeds. The effect of linseed supplementation depends on the type of forage: the increase in cis C18:1 concentration is higher with alfalfa-based diets, than with maize silage, grass hay and grass silage (in that order) (Glasser et al., 2008). Increasing the inclusion rates of raw linseeds from 0 to 15% DM in a dairy cow diet linearly increased long-chain fatty acids and polyunsaturated fatty acids in milk (Maddock et al., 2005). Extruded linseed introduced into a complete diet based on maize silage and concentrate (70:30) at 2.1 or 4.3% of the diet changed the milk fatty acid profile. Most of the saturated fatty acids decreased with increasing linseed levels except C18:0 while unsaturated fatty acids increased. However, the butter made from milk produced with linseed had the same colour, smell, flavour and aroma as the butter made from diets without linseed (Hurtaud et al., 2010). Several studies have demonstrated that the use of linseeds up to 20% in feedlot diets does not affect performance and may reduce the incidence of disease (Newkirk, 2008). Including linseeds in rations increases the omega-3 content of meat products (Raes et al., 2004; Maddock et al., 2006; Newkirk, 2008; Litton, 2011). Feeding ground linseeds slightly modifies the long-chain fatty acid profile in the ribeye, by increasing both linoleic (C18:2) and alpha-linolenic (C18:3) acids (LaBrune et al., 2008), as well as the unsaturated fatty acids in the muscle (Maddock et al., 2005). Including bruised or formaldehyde-treated linseed in a 60:40 silage:concentrate diet for steers increased the proportion of intramuscular unsaturated fatty acids (C18:3, C20:5, C22:5) (Raes et al., 2004). Whole, ground or rolled linseed included at 8% or 10% in feedlot diets or finishing heifer diets did not change the DMI (Litton, 2011; LaBrune et al., 2008; Maddock et al., 2006; Maddock et al., 2005). Rolled or ground linseeds significantly increased the daily weight gain by 150 g/d (Maddock et al., 2005) to 180 g/d (Maddock et al., 2006), or had no effect (LaBrune et al., 2008; Litton, 2011). The higher weight gain may be partly attributed to more rumen degradable protein, or to the higher energy density in the diet. Feeding linseeds tends to increase internal carcass fat (Maddock et al., 2006) and quality parameters such as the marbling score (Maddock et al., 2006; Maddock et al., 2005). Linseeds are suitable for pig feeding and they have been used with increasing frequency since the 1990s, both to produce meat products enriched in alpha-linolenic acid (ALA) and to improve sow productivity and piglet health. Pig meat enriched with omega-3 fatty acids was also reported to result in a juicier and tastier meat product (Newkirk, 2008). Linseeds contain mucilage, phytic acid, goitrogens, allergens and anti-pyridoxine that can be inactivated by heat processes such as extrusion. Extruded linseeds were found to have a higher energy digestibility than ground linseeds in pigs (76 or 84% vs. 51% depending of the extrusion method; Noblet et al., 2008). The extrusion of linseeds improves the digestibility of fat, energy and amino acids, changing the physical physicochemical properties of dietary fiber and/or limiting the effect of heat-labile antinutritional factors (Htoo et al., 2008). 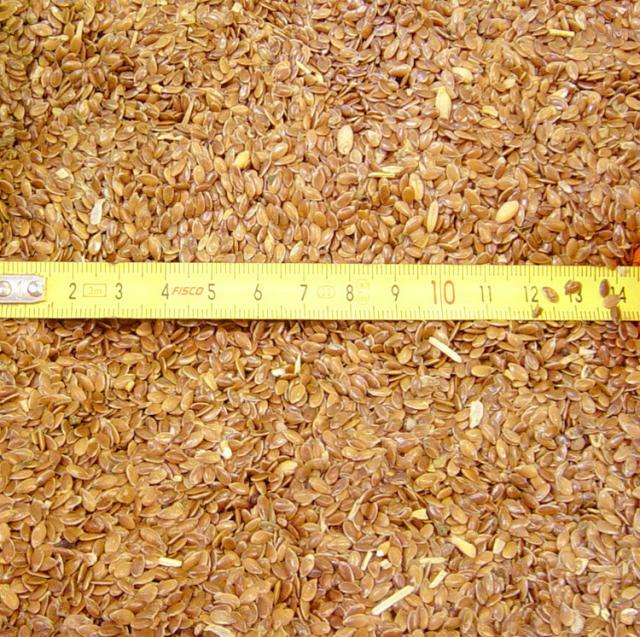 The DE value for ground linseeds varies from 12.7 to 13.9 MJ/kg (Noblet et al., 2008). Linseeds are deficient in lysine (4.6 vs. 6.1% protein for the soybean meal; Sauvant et al., 2004). Its apparent ileal digestibility is also very low (69 vs. 87% for soybean meal; Noblet et al., 2002). In a 50:50 blend of pea and linseed, extrusion increased the apparent digestibility of lysine by 23-26% (Htoo et al., 2008). Linseeds can be included up to 10% in growing pigs diets without negative effects on performance (Matthews et al., 2000). Blends of peas and linseeds are easier to process and handle, contain more lysine, and can be included at higher rates than linseeds alone. A 50:50 extruded linseeds:peas mixture was fed at up to 15-20% of the diet of growing pigs without affecting growth (Beaulieu et al., 2010). Another trial included this blend at up to 22.5% in the diet without detrimental effects, but performance decreased when the inclusion rate reached 30% (Thacker et al., 2004). In finisher pigs, the inclusion rate of linseeds was raised up to 15% for 28 days prior to slaughter without affecting performance (Romans et al., 1995a). A 50:50 extruded linseeds:peas mixture gave sufficient performance up to 18% inclusion in the diet but weight gain was depressed at 24% (Thacker et al., 2004). Because the fatty acid profile of the meat and fat is directly affected by dietary fat, it is possible to change the omega-6:omega-3 fatty acids ratio by feeding linseeds to pigs. In pigs fed up to 15% ground flax 25 days prior to slaughter, the ALA content in the inner backfat increased from 10 mg/g (no linseed) to 53 mg/g (15% linseed). EPA (C20:5 omega-3) increased from 0.09 to 0.38 mg/g (Romans et al., 1995a). Feeding duration could be reduced to 21 days prior to slaughter to achieve an optimal ALA concentration (Romans et al., 1995b). ALA concentration in the fat of pigs fed 15% linseeds for 28 days increased from 1.1% to 8.8% and from 1.3% to 12% in pigs fed linseeds for 42 days (Specht-Overholt et al., 1997). Feeding higher levels of linseeds for shorter periods versus lower levels for longer periods is more efficient at increasing ALA content in pig meat (Juarez et al., 2010). Linseeds can be used at the time of parturition to alleviate constipation in sows. There are also positive effects of ALA on the long term health and performance of sows. Feeding linseeds at 5% over 3 consecutive parturitions increased the number of pigs weaned per sow, piglet weight at birth and weaning, and the reproductive performance of the sows (Lawrence et al., 2004). Feeding linseed to sows may have beneficial effects on the immune system of piglets and may increase the post-weaning growth of piglets (Farmer et al., 2010). In poultry, linseeds are of a lesser nutritional value compared to other oilseeds, due to their physical structure, their deficiency in lysine, and the presence of antinutritional factors, such as anti-pyridoxine and mucins. These cause high viscosity of digesta and result in lower performance and feed efficiency (Shen YingRan et al., 2004; Pekel et al., 2009; Alzueta et al., 2003). However, their high content in omega-3 fatty acids has led to their increasing use in poultry. Many experiments have investigated processing methods for improving the nutritional value of linseeds in poultry and have tried to determine their optimal inclusion rates (Shen YingRan et al., 2005b; Van Elswyk, 1997). The recommended inclusion rates of linseeds for broilers range between 2 and 10% of the diet (Ochrimenko et al., 1998; Richter et al., 1998; Bakhiet et al., 1995; Kang et al., 1994). However, it has been suggested that including linseeds at up to 12%-15% in the diets of broilers could improve the omega-3 fatty acid content of the meat without impairing performance too much (Huthail Najib et al., 2011; Pekel et al., 2009; Shen YingRan et al., 2005a). Pelleted or roasted linseeds should be used in preference to raw linseeds. Linseeds have a lower energy value than other oilseeds, with TME values for raw seeds about 14-15 MJ/kg DM, and a low fat digestibility (61%) (Shen YingRan et al., 2004; Lee et al., 1995). The low energy value can be increased by processing. Pelleting and autoclaving were found to increase the TME up to 17-18 MJ/kg DM (Shen YingRan et al., 2004). Pelleting and roasting increased the digestibility of total fatty acids by 29% and 39%, respectively (Shen YingRan et al., 2005b). Pelleted linseeds at an inclusion rate up to 10% of DM did not impair performance (Shen YingRan et al., 2003). In Saudi Arabia, roasting linseeds and including them at 15% in broiler diets had a positive effect on omega-3 fatty acid content and animal performance (Huthail Najib et al., 2011). The addition of vitamin B6 to counterbalance the effect of linatine enhanced animal performance (Shen YingRan et al., 2003). The addition of antioxidants to poultry diets containing 15% linseeds resulted in increased levels of polyunsaturated fatty acids, in a lower content of saturated fatty acids and in a lower omega-6:omega-3 ratio (Ajuyah et al., 1993). Fibre-degrading enzymes (carbohydratase) and the progressive introduction of poultry to linseeds have been shown to alleviate the antinutritional effects of mucins (Slominski et al., 2006). Feeding linseeds in mixture with other seeds had a positive effect on both animal performance and omega-3 deposition. A diet containing an extruded or non-extruded combination of linseeds with peas or rapeseeds, included at 12.5% of the diet, as a partial replacement for soybean meal, resulted in similar growth rate and feed conversion efficiency (Thacker et al., 2005). A diet supplemented with a mixture of 6% linseeds and 6% rapeseeds resulted in better animal performance than diets supplemented with 8% of either seeds alone (Krasicka et al., 2000). Feeding linseeds for longer than 16 days may result in a pH drop and subsequent poor meat quality (cooking losses, drip loss, and higher susceptibility to oxidation) (Betti et al., 2009b). However, it was shown that an omega-3 fatty acid content of 300 mg/100 g meat in breast, thigh and wing meat required at least 26 days at 10% inclusion rate or at least 11 days at 17% inclusion (Betti et al., 2009a). Other experiments report longer feeding periods (36 days at 12% in Canada, 42 days at 15% in Romania) (Jia et al., 2011;Taulescu et al., 2011). It is likely that optimal inclusion rates are a trade-off between health requirements and meat quality. Including linseeds in layer diets is done worldwide, including in warm climates, in order to increase the omega-3 fatty acid content of eggs and decrease their omega-6:omega-3 ratio (Ahmad et al., 2013; Al-Nasser et al., 2011). Linseeds could increase the omega-3 content in eggs and reduce the omega-6:omega-3 ratio at levels starting from 5% (Criste et al., 2009). Inclusion rates reported in experiments range from 7.5% to values as high as 20% (Ahmad et al., 2013; Gurbuz et al., 2012; Al-Nasser et al., 2011; Betancourt et al., 2009; Leeson et al., 2007; Bean et al., 2003; Basmacioglu et al., 2003; Sari et al., 2002; Botsoglou et al., 1998; Roth-Maier et al., 1998; Aymond et al., 1995; Cherian et al., 1991; Caston et al., 1990). However, inclusion rates over 10% can hamper performance (hen weight; laying performance, egg mass, yolk weight, yolk percentage, feed costs) (Ahmad et al., 2013; Betancourt et al., 2009; Bean et al., 2003; Sari et al., 2002; Novak et al., 2001; Roth-Maier et al., 1998). Some authors recommend including linseeds at levels below 10%. For example, linseeds included at 7.5 %, 8.6% or 10% had no negative effect on performance (egg weight, yolk weight, yolk ratio, albumen weight, albumen ratio, shell weight, shell ratio, shell strength and shell thickness) but still resulted in omega-3 accumulation in egg yolk (Al-Nasser et al., 2011; Basmacioglu et al., 2003). Processing and supplementation have been proposed to alleviate the negative effects of linseeds on layer performance. Roasted linseeds included at 10% resulted in higher production than raw linseeds (Huthail Najib et al., 2010). Grinding linseeds had a positive effect on egg weight (Yannakopoulos et al., 1999). Ground linseeds at 15% or at 16% of DM supplemented with vitamin B6 had a positive effect on omega-3 fatty acids in yolk and no deleterious effect on its susceptibility to rancidity (Aymond et al., 1995; Cherian et al., 1991). A diet based on pearl millet (Pennisetum glaucum) as main source of grain, in combination with linseeds (at 4, 6 or 8%) and natural pigments (at 0.1%), allowed to reduce linseed inclusion down to 6% while yielding as much omega-3 fatty acids as needed to meet the standard for "omega-3 enriched" market eggs, without hindering performance (Amini et al., 2008). Linseeds included at 9% and above in layer diets reduced cholesterol in egg yolk (Basmacioglu et al., 2003; Sari et al., 2002). However, such a reduction was not observed in an earlier experiment (Botsoglou et al., 1998). Trained panelists have been able to identify eggs from hens fed linseeds by noting differences in flavour, aroma and off-flavour (Hayat et al., 2010). In a 1992 study, 36% of sensory evaluations reported fishy or fish-related flavour in eggs from hens fed linseed, which was absent in eggs from hens fed no linseeds or fed high-oleic acid or high-linoleic acid sunflower seeds (Jiang et al., 1992). However, in a later study, eggs from hens fed a linseed diet enriched with thyme had the highest scores for odour, flavour, and overall acceptability, as well as the lowest score for off-flavour (Tserveni-Goussi, 2001). In rabbit feeding, linseeds are used for three main reasons: as a source of dietary lipid (i.e. as a source of energy); to provide a significant part of the diet protein; and to increase the diet content in omega-3 fatty acids, mostly alpha-linolenic acid (ALA). Whatever the objective for using linseed in rabbit feeding, inclusion rates vary from 2-3% up to 9-10% (Bianchi et al., 2009; Kouba et al., 2008; Colin et al., 2005; Maertens et al., 2005; Castellini et al., 2004). For experimental purposes, linseeds could be safely included up to 16% (Peiretti et al., 2010) and as high as 39% (Johnston et al., 1985). Linseeds have been fed raw to rabbits (Peiretti et al., 2010; Bianchi et al., 2009), or extruded (Castellini et al., 2004; Colin et al., 2005; Johnston et al., 1985). Even though direct comparisons of the biological efficiency in rabbits of processed and unprocessed linseeds are not available in the literature, known studies suggest that processing linseeds may not be necessary for rabbit feeding and that positive and negative effects of processing, such as extrusion, may offset each other. For instance, while extrusion has been shown to reduce tannin content and to inhibit antinutritional factors (Mukhopadhyay et al., 2007), tannins may also have potential benefits in rabbits (Liu et al., 2012; Dalle Zotte et al., 2012). As a source of energy, feeding linseeds can result in growth rates and slaughter performances equivalent to those obtained with sunflower seeds (Bianchi et al., 2007). As a source of protein, linseeds are deficient in lysine, covering only 70% of the requirements of a growing rabbit, but the sulphur-containing amino acids content covers about 110% of requirements. Therefore, linseeds could be considered as a suitable source of proteins for both growth and reproduction, when compared to soybean seeds or safflower seeds as a main source of protein (Johnston et al., 1985). As a source of alpha-linolenic acid, linseeds are as efficient as linseed oil to increase the omega-3 fatty acids content of rabbit meat (Lebas, 2007; Dalle Zotte et al., 2011; Peiretti et al., 2010), or of rabbit milk (Maertens et al., 2005). The presence of a high dietary proportion of ALA from linseed oil (included at 8% of the diet) improved the immune status of rabbits (Kelley et al., 1988), and reduced mortality during the weaning-to-slaughter period. This effect has been observed both with linseed oil (Matics et al., 2012) and linseeds (Maertens et al., 2005; Colin et al., 2012). The inclusion of 5% extruded linseeds in the diet was shown to improve the quality of rabbit spermatozoa (Castellini et al., 2004). Linseeds are a traditional coat conditioner (gloss) and laxative feed for horses. Horses relish the taste of cooked linseeds mixed into a wet bran mash (Kohnke et al., 1999). Linseed-based supplements are a good source of protein and fat and have been shown to increase the protein and fat digestibility of hay and oat mixtures for horses. No adverse effects on the digestibility of any component of the diet or on the health of the horses were observed (Saastamoinen et al., 2010). Linseeds have been used for horses that had suffered from sand colic (due to dust and sand absorption during feeding) to remove the sand from the gastrointestinal tract (Sarkijarvi et al., 2010). There are no reports of linseeds in fish feeding (as of November 2013). However, the inclusion of linseed oil is highly valued for enhancing the omega-3 fatty acid content of farmed fish. Matics, Z.; Gerencsér, Z.; Szabó, A.; Fébel, H.; Szin, M.; Radnai, I.; Szendrö, Z., 2012. Effect of supplementation of linseed oil, vitamin E and selenium in diet on meat quality of growing rabbits. Proc. 10 th World Rabbit Congress – September 3 - 6, 2012– Sharm El- Sheikh –Egypt: 967-971. Przybylski, R., 2005. Flax oil and high linolenic oils. In: Bailey’s Industrial Oil and Fat Products, Sixth Edition, John Wiley & Sons, Inc.